There has been an epidemic of unknown proportions in Candy Land. Sweet-toothed gremlins have invaded Candy Floss Forest decimating the red liquorice logs, the toffee toadstools, the dulce leche dirt and the candied pecan pinecones. There is almost nothing left of our magical, mystical forest. As the local candy botanist, I’ve been tasked with collecting samples of the hardiest specimens I can find to learn from their gremlin-defying greatness. While this shortage of candy has caused a great exodus from Candy Land, those that remain will be glad to know that I found two viable, and delicious (I tasted them in the name of pure scientific research), specimens left: the white and dark chocolate barks. This entry was posted in Chocolate, Dessert, Vegan and tagged bark, Chocolate, chocolate bark, chocolate bark recipe, dark, dark chocolate bark, dessert. 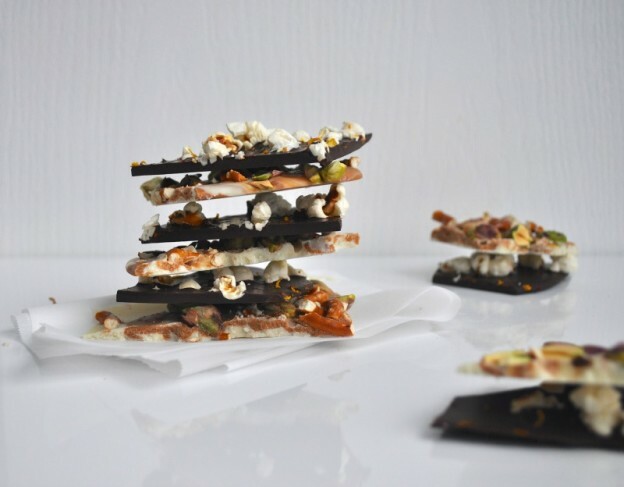 snack, easy chocolate bark recipe, food, nuts, popcorn, popcorn chocolate bark, popcorn chocolate bark recipe, pretzel, pretzel chocolate bark, pretzel chocolate bark recipe, recipe, salty chocolate bark, spicy chocolate recipe, Sweet, unique chocolate bark recipe, white, white chocolate bark on January 3, 2015 by mysecondbreakfast.